China and Cuba, two traditional friends sharing a lot in visions and beliefs, are seeking closer ties as Havana moves to update its economy under the shadow of a half-century-old U.S. embargo. 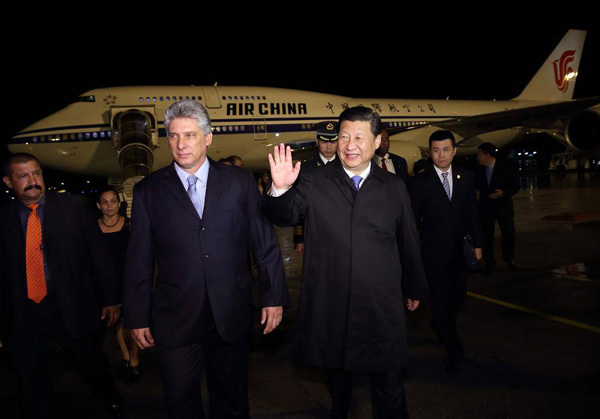 Chinese President Xi Jinping will hold talks with his Cuban counterpart Raul Castro during his ongoing visit to Cuba, the last stop of his four-nation Latin America tour, with a goal to translate the bilateral high-level political relations into rich results of practical cooperation. In 1960, Cuba took the lead among countries in the Western Hemisphere to establish diplomatic relations with New China, opening a new chapter of China's relations with Cuba and with Latin America. China-Cuba relationship has since withstood the test of a constantly-changing international landscape. Also in the 1960s, the United States, one of the world's two sole super powers then, imposed economic sanctions on Cuba to punish its leadership's intention to align itself with the Soviet Union, the other super power, putting the island nation in a sensitive geopolitical position. As the world becomes more multipolarized, and peace and development have become more important factors in governing country-to-country relations, China-Cuba cooperation has shifted from politics to economy and has been galloping on a fast track. China has been a rising key foreign investor in Cuba especially after 2012 when world countries, developed and developing countries alike, were battered by a devastating financial crisis. China granted free assistance and interest-free loans to Cuba to promote bilateral economic and technological cooperation, and undertook several large-scale infrastructure projects in Cuba. For years, China has been Cuba's second-largest trading partner, while Cuba is China's largest partner in the Caribbean, with bilateral annual trade standing at a little less than 2 billion U.S. dollars. While China, now the world's second-largest economy, has never been a back-seat driver for Cuba's development, the island nation still faces tough economic and social challenges largely due to Washington's unwillingness to lift its decades-old embargo despite criticism from even its allies. Though the U.S. sanctions have evolved in various ways, they are outdated and irrational, bringing nothing but sufferings to Cuba's 11 million people. Against all the odds, the Cuban government has been phasing in a series of economic reforms in recent years to revitalize its stagnant economy, encouraging enterprises and lifting restrictions on such fields as property use, travel and farming. Havana's reform drive creates new opportunities for deepening its cooperation with China, and the world's other major economies, especially the United States, also need to seriously consider the new developments and rethink their policy toward Cuba. For Washington, the first step should be lifting its sanctions. Instead of being an obstacle on Cuba's path of development, the United States should join China and other countries to become Cuba's constructive partners in efforts to achieve prosperity, which will benefit not only the Caribbean country, but also the Untied States itself.